Need a truck that can keep up with your hard work and overcome any challenge? Then, check out the 2018 Nissan Titan! Built with a rigid body structure for optimum integrity, the new Titan is designed to offer many advantages to drivers who enjoy operating a powerful pick-up truck. Powered with a 390-horsepower, 5.6-liter Endurance® V8 engine, the Titan is able to tow up to a maximum of 9,740-pounds when properly equipped. And with the right configuration, the 2018 Titan has a maximum of 1,950-pounds. Plus, there are several advanced technologies that improve its towing capability and handling. This includes the Tow-Haul Mode, RearView Monitor, available Brake Controller and Intelligent Around View® Monitor. Then, overall, the Titan is engineered with ample ground clearance, Active Brake Limited Slip and has the option for shift-on-the-fly 4-Wheel Drive. Along with its impeccable capabilities, the 2018 Titan is also outfitted with many premium amenities and innovative features. For instance, with the available Remote Engine Start System with Intelligent Climate Control, heated steering wheel and heated and cooled front seats, you can always keep the cabin at your comfort level. Plus, for extra versatility and cargo options, the rear seating features a Virtual Workbench configuration for getting work done, an under-seat storage tray and fold-flat floor panels for a convenient loading floor. And the center console storage area is even large enough to hold a small laptop! There are plenty of advanced technologies that the Titan can be equipped with, ranging from driver-assistive to connectivity features. In fact, occupants can enjoy Nissan Intelligent Mobility, Nissan Navigation System, Bluetooth®, multiple USB ports and NissanConnect® Services powered by SiriusXM®. Then, for more peace-of-mind while driving, you can take advantage of the Nissan Intelligent Mobility technologies like Blind Spot Warning, Front and Rear Sonar System and Rear Cross Traffic Alert. 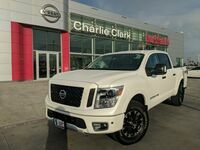 For more information on the 2018 Nissan Titan, you can contact us online or by calling us at 956-295-3028. You can also schedule a test drive online!